Do you have pictures to show to people all over the world and you just don't know how to put them on the internet and create a links to all of them? Html Web Gallery Creator is the right thing for you. Do you have pictures that you would like to show to people all over the world and you just don't know how to put them on the internet and create a links to all of them? SoftOrbits Html Web Gallery Creator is the right thing for you. 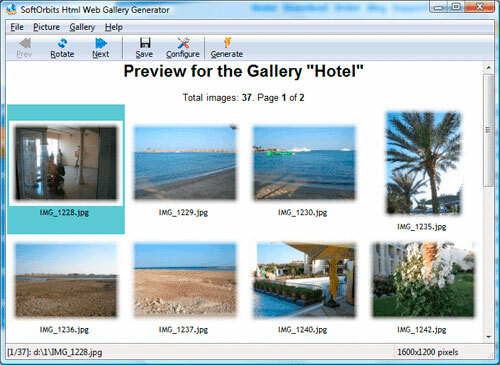 Program creates friendly web pages on which it puts your photos. Every page has a link to the previous picture and the next picture, and to the main index file that SoftOrbits Image to HTML Converter creates for you. You can choose the page colors, fonts, number of thumbnails per page and other settings. Then you can preview created web gallery in your favorite browser and your web album is ready to be published! The application is very easy to use but very powerful. If you want to post your digital photos to the internet, chosing SoftOrbits Image to HTML Converter is the right decision! You will find out that you like using SoftOrbits Html Web Gallery Creator very much to convert images to HTML. Convert your images to HTML easily. No need of using PHP / CGI / ASP / Java etc.